Frank Lucas will tell you the best bargain he ever got at a garage sale was his wife, Ginny. What? Well, she wasn’t on a table or anything like that. Their mutual friend, Paula, had unsuccessfully tried to get the two to meet in the past. It wasn’t until she held a garage sale that life would change for the two. Ginny was helping Paula with signs; Frank pulled up across the street to have coffee with his mother. After meeting face to face. Frank’s curiosity was piqued. but Ginny left to post signs! Paula told Frank that Ginny didn’t date; however she did suggest he invite Ginny to play tennis.., that was 33 years ago. Individually; Ginny and Frank are fascinating. Diverse backgrounds. interesting stories, and more hobbies than one knew existed! But, together, they form two halves of one very enviable whole. They have mutual love and respect for one another; a family they adore, a successful business, and a comfort level in their lives most people can only dream of. While acquiring her psychology degree, Ginny needed to pass a statistics class to graduate—not exactly her forte. She visited psychologist, Dr Irving Roy, to overcome her hatred of math. Not only did Ginny get an A, she got the highest grade in the class! Ginny later returned to Dr. Roy to learn self-hypnosis, an area of study that would later turn Ginny and Frank’s lives around in a whole new direction. Ginny worked as a legal secretary for 20 years when she realized she wanted something new. Her previous experience with hypnosis proved a catalyst. Armed with her degree in psychology Ginny then got her Doctorate in Clinical Hypnosis She started her professional practice, Evergreen Hypnosis, in 1992, and recently got her Ph.D. in Psychology. Frank’s way with words is one thing Ginny admires about him most. She considers that one of his biggest attributes as a successful hypnotherapist, where she says, “Effective use of language is so important’” Exceptional people skills also factor in to Frank’s personality. Ginny was awarded Small Business Person of the Year in 2003, by the Greater Stockton Chamber of Commerce. As a “thank you” she sent them Frank, where he now serves on several committees. Communication has served Frank and Ginny well in their professional lives, but it’s also a key to their successful marriage. Ginny knows that what you are saying to someone isn’t necessarily what they are hearing from you. That’s why she and Frank are open and honest with one another, even if it does hurt. They don’t hold back, they keep it on the level. But, they balance out the hurt with laughter. 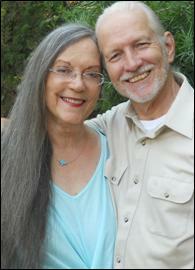 This honesty and understanding was missing in both of their previous marriages. This “balance” is something they have in day to day activities, as well. Doing a crossword puzzle: Frank knows the answer, Ginny spells the word. On a car trip: He knows how to get there, she knows how long it will take. She knows how to pick a present for somebody; he’s the only electronic-savvy one in the house! A passion for martial arts was a common interest for Ginny and Frank that they didn’t even know they had until their daughter started lessons at age 13. Remaining active is something Frank and Ginny take pride in. Whether it’s martial arts, the yoga Ginny teaches at UOP, or tearing down and rebuilding their deck, these two are always doing something. Running after grandchildren and great-grandchildren doesn’t hurt, either. 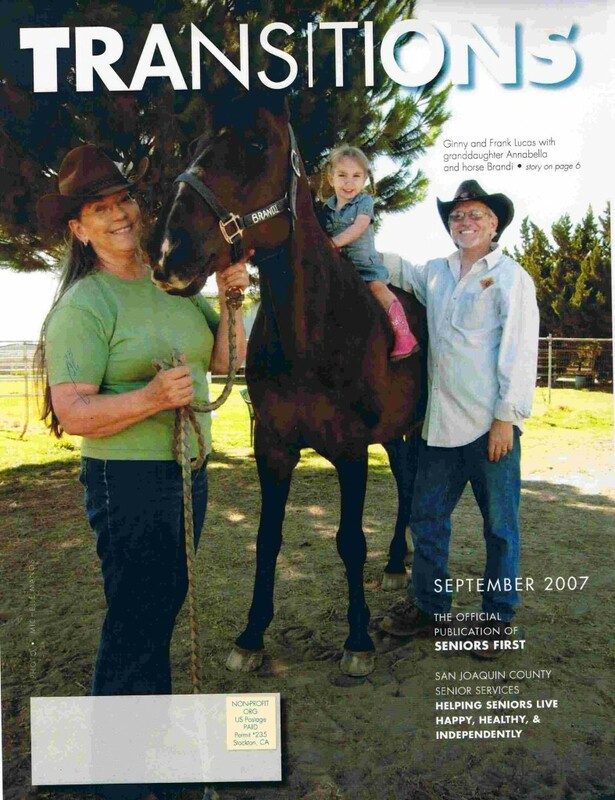 Horses are another interest of Ginny’s since her late twenties. She’ll tell you, “Once they’ve been a part of your life, nothing else can take their place” After seeing the film, “Seabiscuit” Ginny missed having a horse. Finally, after “Open Range” and “Hidalgo’ she told Frank, “Honey, I NEED a horse!” Soon, Ginny got Brandi, a quarter horse. She was ready to change Brandi’s name, but realized that Brandi wasn’t a horse whose name you change. Ginny knows that she and Brandi are very similar and that’s why they get along so well. As a child, Ginny was told that she was more trouble than she was worth. Frank has since changed that to, “You’re a lot of trouble, and you’re worth it’ And that’s how she feels about Brandi. Although Ginny has officially retired from Evergreen, she keeps busy with other projects, including mentoring younger hypnotherapists, writing books, and producing and recording self-hypnosis CDs. They target affirmation, success, insomnia, memory, Just to name a few. Frank continues his hypnotherapy at Evergreen, where he thinks he’ll be for another 10 to 15 years. in the meantime, they hope to have one or two of the hypnotherapists Ginny has mentored step in, under their supervision.